Ding-dong! the witch is Dead! Which old witch? The witch plastered to the front of your house, that’s who! That’s right, this witch wasn’t just careless enough to let a house land on top of her––she’s so clueless she ran straight into one! Want to give the trick-or-treaters the giggles? Why not added a dimwitted witch to your yard decor? This clever decoration features a witch who may need to go back to broom-flying classes with Madam Pomfrey for a few more lessons. 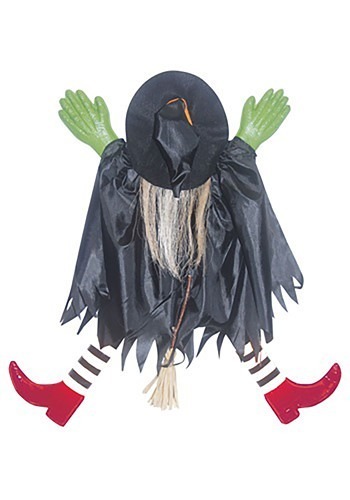 This Tree Trunk Witch w/Red Shoes can attach to the side of your house, a door, or any tree you may have in your yard and will be sure to put a smile on all the neighbors’ faces! Do all witches wear red shoes and black-and-white striped socks, or only graduates of a certain witches’ school? Is there a particular witches’ shop that sells these accessories? In our limited witch experience, we’ve only seen them on witches of the wicked variety wearing this getup, so you can rest assured that no Glinda, Sabrina, Hermione, or Stevie Nicks types are in need of medical attention on your lawn.